Award winning artist Francesca Samsel tells of her journey from murals to scientific visualizations, and explains how a dash of color theory is changing scientific perspectives. SC15 award winning visualization artist tells her story. Color theory changing landscape of scientific visualizations. 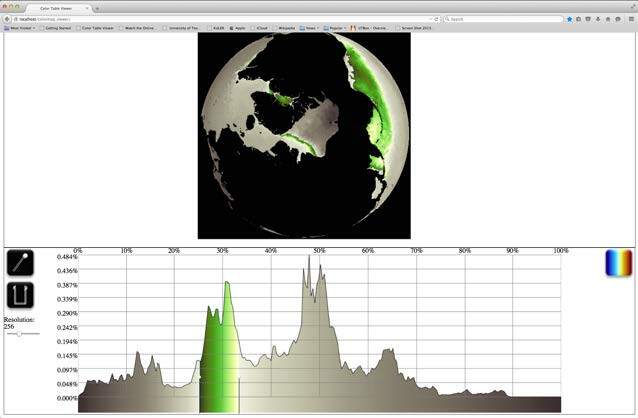 Tools like ColorMoves bring new perspective and insights to scientists. Francesca Samsel is the visualization artist on a team that just received the award for Best Scientific Visualization and Data Analytics at the Supercomputing 2015 (SC15) conference. She explains her journey from multimedia artist to scientific visualization artist, how a dash of color theory brings data into sharp focus, and ongoing research into tools scientists can easily access to see more deeply into their data. 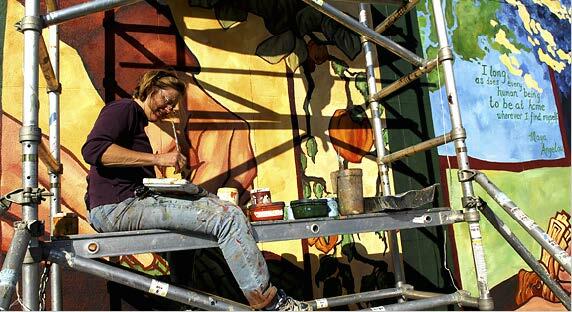 For many years I spent summers painting murals on the sides of buildings and winters researching environmental topics for upcoming work in printmaking my New York studio. In 2010, I was working on a series of prints for an upcoming exhibit. The prints were filled with oil-like textures and fractured platform structures. Only as they began to come together did I make the connection with the ongoing 2010 Gulf Oil spill. As the oil continued to pour into the Gulf and the scope of the damage grew, it became clear that paper prints, hanging on pristine gallery walls, could never convey the angst and horror unfolding in the Gulf. Technology that allowed us to drill a 3,000 foot well a mile below the ocean surface needed a 21st century medium. 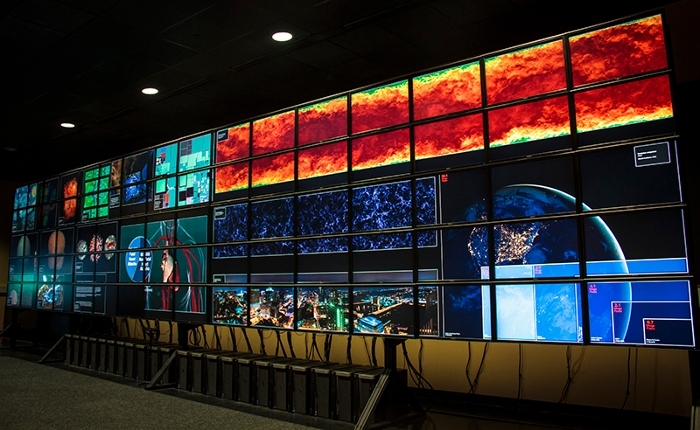 Invited to work in the Visualization Lab at Texas Advanced Computing Center (TACC), at the University of Texas, Austin, I began a series of artistic works based on those prints – re-designing visualizations, documentary, and metaphoric content about the spill on Stallion, their 80-paneled, 328 megapixel digital display. This work led to a short artist-in-residence stint at the Los Alamos National Laboratory (LANL) and then to a long-term collaboration with the Data Science at Scale team at LANL. It was there that we began looking into means of applying color theory to visualization and analytics of exascale data sets. It quickly became clear that to apply artistic color theory to scientific visualization I would need a means of constructing color maps in HSV space. (HSV: Hue – is it red or blue? Saturation – is it bright or dull? Value – is it light or dark?) Generally, computational color tools are created in RGB (red, green, blue), the computer’s language for representing color. However, HSV is a much more intuitive means of working with color. Using HSV enabled us to apply artistic color principals to color map construction. This switch provided greater fidelity and enabled subtle but perceptible – and scientifically significant – changes within the color sequences of the color maps. 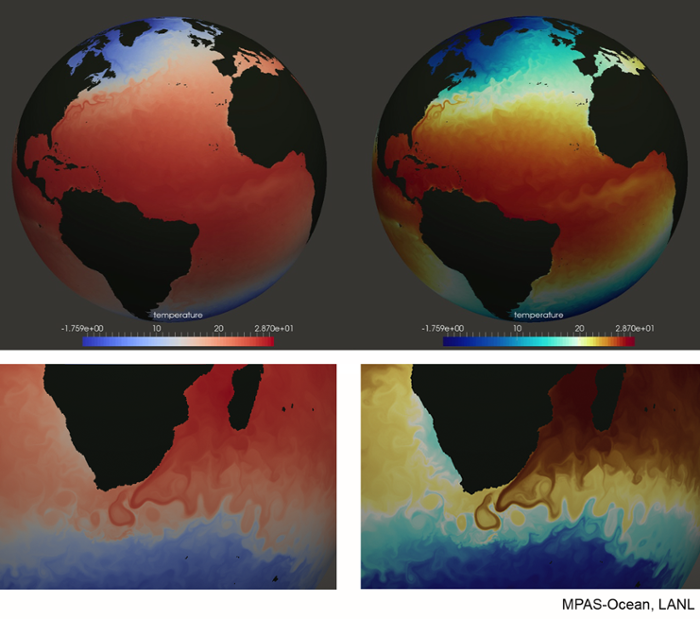 For instance, applying the color scales to work with the MPAS-Ocean group at LANL revealed greater detail within their temperature models. Encouraged by this success, Mark Peterson of LANL's Climate Ocean Sea Ice Modeling group (COSIM) and I began to look at other variables, including vorticity, salinity, and kinetic energy. As a team, we started work on tools enabling a greater range of color contrast to be inserted at the areas of greatest interest. Whereas the traditional rainbow color maps have long been known to obscure and distort regions of datasets, HSV let us produce color maps that are constructed to enable easy exploration of all regions of a database and all variations in data values. As we began working with scientists from other domains, we learned what they needed to accomplish with their visualizations. Though many of these domains have their own color conventions, we found that scientists are often open to using alternatives if they convey information more effectively, and when the tools for developing these color maps are simple and intuitive. Our interactions with these scientists also taught us that we could identify characteristics of data that could be used to derive more effective color maps. For example, different color principles apply to categorical datasets than continuous datasets. Further, we found that statistical analysis of continuous datasets can produce information that is useful in developing color maps that are specifically tailored to scientific questions. These points have led us to focus on tools for scientists that enable them to develop color maps that are best suited to their specific needs. ColorMoves, now in development, is a tool providing scientists with color map recommendations, the means to customize the recommended maps, and an ability to construct maps from linear color scales. ColorMoves will include colormap suggestions for domain specific uses and statistical distributions along with an intuitive user interface that simplifies the hands-on process of adjusting color maps. ColorMoves includes suggestions of color scales common in different domains, statistical analysis to provide information about specific datasets, and an intuitive user interface that simplifies the hands-on process of adjusting color maps. Our user studies have shown that, given these tools, domain scientists see that they are not only interested in constructing their own color scales or linear maps from data space into a color range, but are also interested in developing structured color maps that apply different color scales to different sub-ranges of the data. It is the direct collaboration with scientists from many domains has enabled us to apply the color and design expertise from the artistic community to contemporary scientific questions. Art and Science. Francesca Samsel, Mark Petersen, Greg Abram, Terece Turton, David Rogers, and James Ahrens shared the award for Best Scientific Visualization and Data Analytics at the Supercomputing 2015 (SC15) conference. 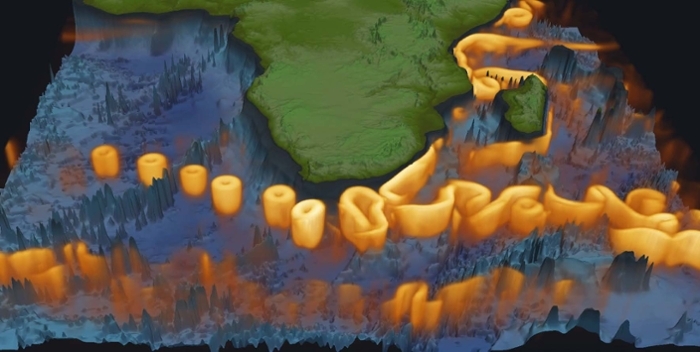 Their work on ocean current modeling is an important piece of the US Department of Energy's Accelerated Climate Model for Energy (ACME), a strategy to better understand the science of climate change. Courtesy Francesca Samsel.